It’s a perfect time to make it a memorable day for them and you at the show! 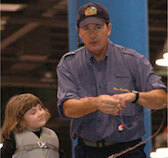 They’ll love participating in the special “Learn to Fish” clinics. Meet a mermaid. And be surrounded by face painters, balloon artists, and favorite some of their favorite characters! Kids Fishing Seminar – 100 free cane rods to first 100 kids!